Don Dokken's namesake band has just released its eleventh studio album, Broken Bones. Like its predecessors, Broken Bones features songs that are as hard and heavy as they are catchy. Along with this usual fare, the record contains some completely unexpected musical stylings. The opener for Broken Bones is "Empire”. Its intro is fast and full of some very heavy guitar work. It sounds like classic Dokken right from the start. Don's vocals are perfectly dramatic and not overstated. Jon Levin--who will unfortunately always be known as George Lynch's "replacement"--provides a great guitar solo to kick off the album. Title track "Broken Bones" immediately follows "Empire”. It has a deep, bass-heavy intro riff, and the low vocals have an almost mysterious quality to them. As the guitar becomes more prominent, the heavy bass line still looms throughout the song. While the chorus is a catchy one, this track has an overall dark sound. That shouldn't alienate Dokken fans though, because the underlying riff is highly reminiscent of "Dream Warriors" from Nightmare on Elm Street 3. The guitar solo from "Broken Bones" is much brighter compared the rest of the track, but it manages to fit in well. I absolutely love the track "Victim of the Crime”. It has a trippy Eastern vibe and really reminds me of the stuff from Def Leppard's 1996 album Slang. It even contains some Leppard-esque backing vocals. "Victim of the Crime" is quite different from most of the songs from Broken Bones, but it still contains those powerful guitar riffs that Dokken is known for. "Today" is a slower song with acoustic flavors. It almost has a '70s folksy rock style with its lyrics, vocals, and great harmonies. This track is even more different and surprising than "Victim of the Crime”. It's totally unexpected from a hard rock band like Dokken, but I must say I really dig it. It was a very ballsy move to include this on a metal record! The track "For the Last Time" begins as an acoustic ballad--or what you think is going to be one. As the electric guitar joins in, it quickly becomes a hard rock song in the vein of classic Dokken. Not only that, the chorus of "For the Last Time" contains some nice harmonies and backing vocals to enhance this classic feel. "Tonight", the final track from Broken Bones, features some ferocious metal riffs in the intro and the verses. The forceful rhythm and the smooth, yet powerful vocals lend this song its classic metal essence. The chorus with the lyric, "Tonight when I close my eyes…” has more of a pop rock sound, but it definitely still has a punch to it. 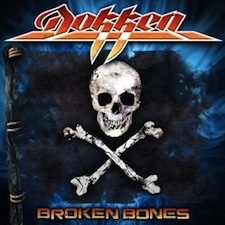 Dokken's Broken Bones contains many hard and heavy tracks, along with some very unique and unexpected moments. This band has done a fantastic job of bringing together a variety of rock, metal, and catchy pop styles to create an unmistakable sound that has continued to evolve from the 1980s to now.